A couple days ago I stepped outside and was pleasantly greeted by a beautiful display of color dancing on the snow! There is just something magical about Christmas lights in Winter! In that moment I was reminded of how joy can come to us when we least expect it! Many times it is the little things in life that can bring us joy… and often they are things right outside our front door! 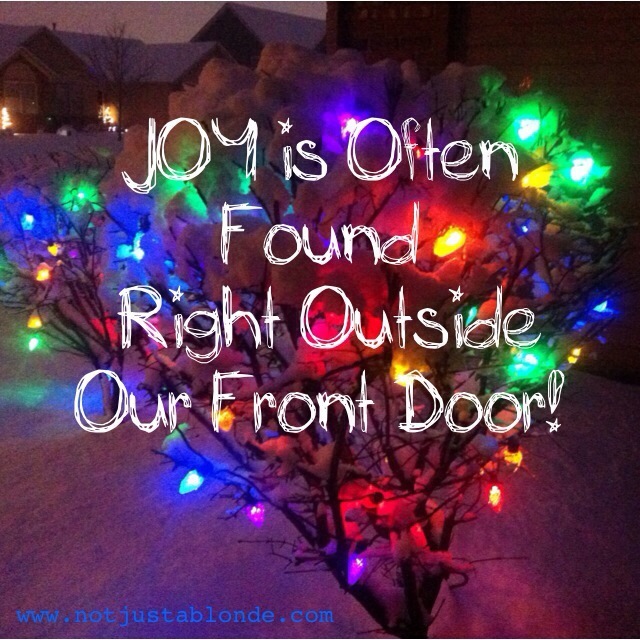 What blessings of joy are in your midst? Perhaps all you need to do is take a peek outside and see! May you enjoy the many of God’s simple blessings this Christmas Season! Sorry, no one named Joy right outside my door. 😉 Only Brunhilda. Perhaps Brunhilda ate Joy? 😜 Lol! You crack me up… you bring ME joy for sure!